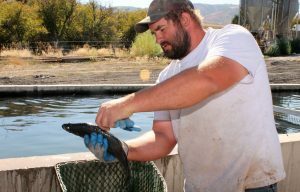 Raising warm water fish near the cool clear waters of Southeast Idaho may seem a little far-fetched, but John Lambregts, an aquaculturist and owner of Dutchboy Farms, has a growing enterprise raising tilapia, barramundi, and largemouth bass near Grace, Idaho. These warm water fish would perish in most of the cool waters of the gem state. Even during the cold of winter John Lambregts, owner of Dutchboy Farms, is busy raising warm water fish along the Bear River near Grace, ID. However, in the fall of 1999, the Holland-born Lambregts became familiar with the Smith Creek Warm Springs. He began building his fish factory a few hundred yards from the banks of the Bear River. 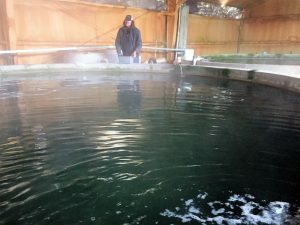 He sells about 100 metric tons of the fish from his 12-acre operation, and also sells fingerlings to other aquaculture farms across the county. The warm springs produces 1,000 gallons a minute at 85 degrees. He built cement raceways and started raising tilapia, later moved to the barramundi and only recently started raising the bass. The water is a good match for the three species of fish grown from different parts of the world. Tilapia, sometimes called aquatic chicken, have large scales and are more meaty than trout. Tilapia don’t have the fishy taste trout is known for. They feed on algae and other aquatic plants. Barramundi can be raised in saltwater or fresh water, they are born male and at three to four years they change sexes and become female. They can grow up to 30 pounds, but the market likes barramundi at a pound-and-a-half to two pounds. The largemouth bass is new to Dutchboy Farms. They are only on their third crop. “Selling fish is a cash business,” Lambregts continued, who holds a master’s degree in agricultural economics from Texas A&M. Richard Ambrosek, who helps manage Dutchboy Farms, carefully checks one of the Barramundi in a raceway at their facility lst week. People who buy Dutchboy Farms products take them home, clean them and cook them within minutes after they get them, he said. Many of their customers are of Chinese or Hispanic descent. The darker tilapia are sold to the Hispanic market and lighter pink ones for the Chinese market. “If you eat fish tacos or fish in a Chinese restaurant, most likely you are eating tilapia,” he explained. Lambregts’s operations manager, Richard Ambrosek, holds a master’s degree from University of Idaho School of Agriculture. John Lambregts checks on an indoor tank of Barramundi fingerlings earlier in the year. 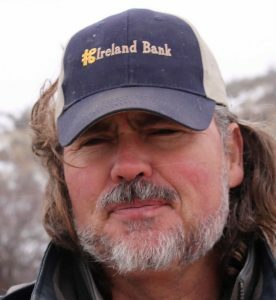 The Caribou County farmer also raises cattle on his farm about four miles from Dutchboy Farms. Working with fish gives him a little diversion. Ambrosek said to deliver their fish, they put them in plastic tanks and load them on top of the trailer; the tanks have oxygen pumped into them to keep the fish healthy during shipping. Most of the fish are sent to the western part of the United States. Every Saturday, Dutchboy Farms opens their gates at 405 River Road in Grace to the public from 9 a.m. to 4:30 p.m. People come from Ogden to Hamer, Idaho to buy their tilapia. Those familiar with tilapia are willing to drive to the remote location to get it fresh rather than buy it frozen in a big box store for less money, Lambregts said.